A very simple wallpaper. I love it alot. If you think had enough you can image soo many feeling in it. You can feel sadness, lonelyness, desperation, hatred. I can't realy image any good feelings in it but maibe it would be something like; calmness, relaxsaion, peace. I hope you can tell me what you think she is feeling at that moment. My personal opinion is that she is feeling hatred but at the same time she is feeling regret for the things she has done that led her to the emptyness she is in now. very strong emotions coming from such a simple piece. I like the suggestion of clouds in the background. That really makes the focal point the girl and her wings. I agree that there are many emotions that can be pulled from her expression. One thing that's bothering me is the shade of black on her wings vs. her outfit. The outfit is a "velvet/shiny" black representation, while the wings are more of a matte black. Which, in reality (wings on people is reality?) 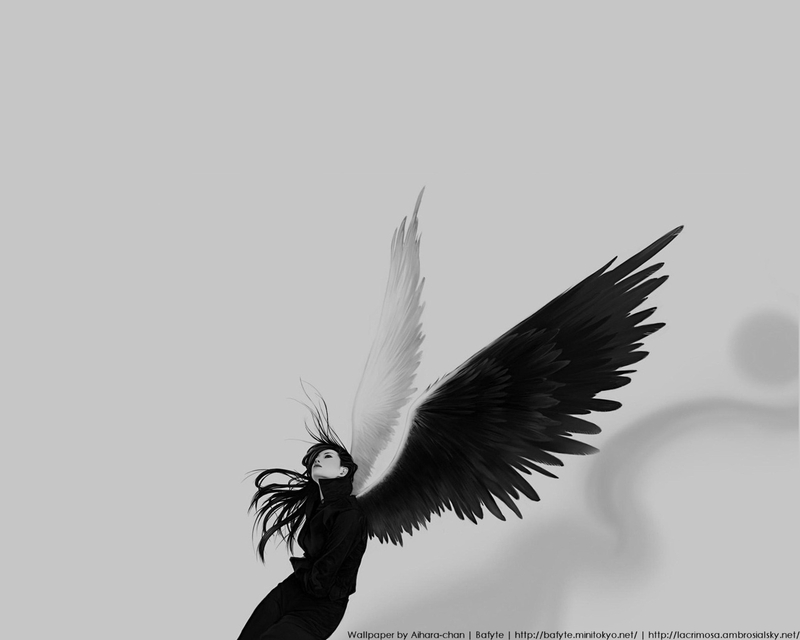 this is right on par for the course, but I think that here it makes the wings seem detached from the girl. Like someone obviously photoshopped them on her, so to speak. Maybe take a little "velvet/shine" off her outfit, cause I like how the wings look a lot. The balance of the wall is a tad off too. There's a bunch of empty space, which I like, but how she's placed in it is almost dead center. I think it'd be more interesting if the character image was somewhat larger and her wing tips were nearer to the top right corner. it makes me teary just to look.... its beautiful! It is simple, but I love it, too! I agree with your description; there's a lot of feelings in here. Beautiful! I feel it like she is so lonely, full of regret, but at the same time, hoping that something wil happen because she seems to search something in the sky. Or may be she is just remembering something painful.